Why not spend a day exploring the Chateau of Versailles. Get two for the price of one on the Versailles Passport Tickets purchased online before January 31st. This ticket allows entrance to the castle, special exhibitions including the current Louis XIV exhibition , the petit Trianon and the Grand Trianon. It might be a little cold for exploring the gardens but it's a great time of year to visit the interior of the chateau as the crowds will be much smaller than at other times of the year. After visiting the castle think about strolling down to the historic Versailles markets. The indoor food markets are open Tuesday through Saturday from 7:30am to 7:30pm, closed for lunch from 1:00pm to 3:30pm. The ourdoor markets are Tuesday, Friday and Saturday mornings. Enjoy lunch at any one of the beautiful little bistros and restaurants that line the market square. 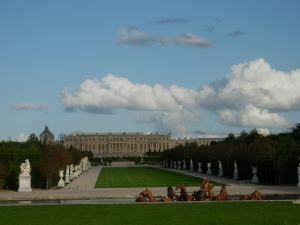 You'll get to experience a part of Versailles the tourists always miss.